By Arthur K Burditt on June 26, 2012. 1) Bloat the company’s stock price in order to buy more stock than the company can issue or repurchase in defense of a hostile takeover, usually by offering far more than the market price of the stock. 2) Coerce the target of the impending takeover to run up debt “junk bond style” to finance a large part of its own sale to the “venture capitalist” or private equity firm. They thus leverage the company’s assets to raise money it won’t be able to repay. 3) Use the U.S. tax code to reduce the target company’s tax liabilities based on the increased debt-service obligations. 4) Generate artificially inflated net revenue and short term profits, which are then paid out to the takeover partners in fees and returns on their fractional share of investment. 5) Liquidate company assets and cut costs to cover the partners’ fees and generate a final return on their investment, before walking away from a now non-viable entity. In practice, this amounted to using “big government” to transfer wealth from taxpayers to Bain partners and investors. According to Los Angeles Times, “during his business career Romney made avid use of [such] public-private partnerships, something that many conservatives consider to be ‘corporate welfare’.” Typically in these deals, management would get 20 percent of profits realized, and two percent of the capital invested as a fee (2-4 times a typical mutual fund fee rate). Essentially Romney-Bain’s LBO takeovers worked like this: Bain, the so-called “private equity firm”, would pay out a fraction of the money required to buy the targeted company. The majority of the cost of buying the company is raised by coercing existing management issuing high-risk debt against the books of the target company itself. Hence, the target would finance most of its own sale. Increased debt payments sale then are written off, reducing the company’s tax liability (typically by about half) and increasing short term revenues. Increased revenues are paid out in dividends to Bain investors, and paid out in management fees to Bain principals. That tax break ends up amounting to a taxpayer subsidy for the scheme. A recent University of Chicago study estimates that the average tax benefit due to debt run-ups for these kinds of takeovers amounts to 10 to 20 percent of the value of the firm. About that much in wealth is transferred, in effect, from taxpayers to “private equity” (a.k.a. Bain, in this case). It’s technically legal in the eyes of the tax man, but clearly not the original public intent of enabling tax legislation. Even many economic conservatives and business interests hold LBO’s in low regard. So much did LBO firms’ reputations suffer in the 1980s that they rebranded themselves as an industry, scuttling the term “leveraged buyouts” in favor of the hitherto not-so-tarnished “private equity”. This bad reputation owes to the fact that target companies going through LBO’s at the hands of “private equity” end up non-viable more often than not. They emerge from the process with far more debt than they can service. Assets that would have enabled them to come back in force already have been liquidated, and debt service costs on low grade bonds and paper prove too high to sustain. Bain’s deal-making yielded mixed results for the investors they rallied to pool their money into LBO gambles. 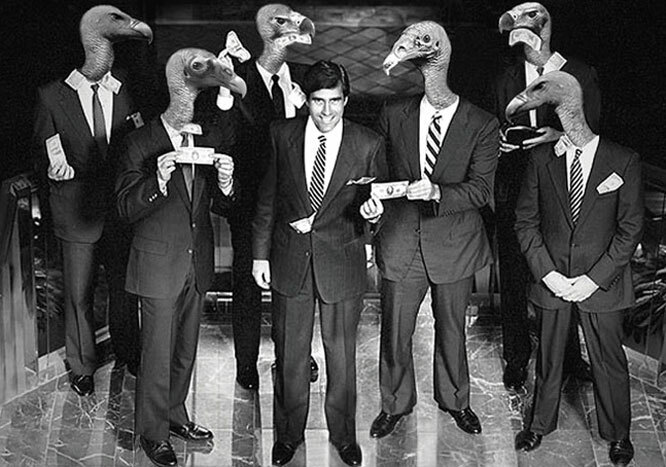 Of 68 deals that Bain negotiated under Romney, 33 lost money for the firm’s investors. However, for Bain partners in the long run, the payoffs garnered from the most lucrative deals, and their fees, made up for the losses. Bain did well by flipping companies fast. Private equity partners under Romney further exploited tax legislation which permitted them to pay low tax rates based on the peculiar class of non-earned income they garnered in this process. U.S. tax code enabled them to pay out no more than 15 percent of their gains in income taxes – far less than what ordinary households have to pay on earned incomes. To Romney’s credit, some of the actual “venture capital” investments he made actually made money, helping viable business models succeed. Staples is the case his team likes to emphasize, because that company actually performed well in the long run due to good fundamentals. Venture capitalism well executed actually follows free market principles – contrary to LBO’s, which in practice resemble sheer paper gimmickry. Bain’s LBO’s and venture capital deals alike were marked by other practices, however, which merit serious concern about their net impact on the U.S. economy. Two areas of great concern are the liquidation of assets, including raiding of pension funds, and the outsourcing of American jobs offshore or overseas. These practices too will be the subject of further investigation by the Hammill Post in the coming weeks.